Two thousand years ago, followers of Jesus utterly astonished their critics. Since then, Christianity's influence has been remarkable. Christian universities, hospitals, and orphanages are the largest social service outreaches in the world. Our faith has shaped the arts, law, science, and civic life. Yet today-particularly in the media-Christians are dismissed as irrelevant. Cooke and Bock show the Christian community how we can once again astonish our critics, and in doing so, completely transform ourselves, others, and the world for good. 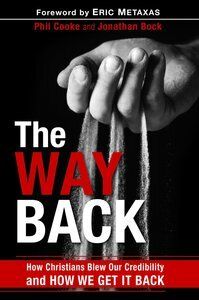 About "The Way Back: How Christians Blew Our Credibility and How We Can Fix It"
According to CNN's Paula Zahn, filmmaker and media activist Phil Cooke is rare - he's a working producer in Hollywood with a Ph.D. in Theology. His blog at philcooke.com is considered one of the most insightful resources on the web on issues of faith, culture, and media. Through his company, Cooke Pictures, based in Santa Monica, California, Phil advises many of the largest and most effective non-profit and faith-based media organizations in the world, and speaks at workshops, seminars, and conferences on a global basis.His online blog at philcooke.com features insight into issues of media and faith, and his upcoming book: Branding Faith: Why Some Churches and Non-Profits Impact the Culture and Others Don't will change the way non-profit and religious organizations use the media to tell their story. His consulting clients have included Joel Osteen, Joyce Meyer, Ed Young, Jr., Jack Graham, Billy Graham, Robert Schuller, and many humanitarian and non-profit organizations globally.